The ASUS BC-12B1ST 12X Internal Blu-ray Drive Combo is your choice for high-definition entertainment. The ASUS BC-12B1ST 12X Internal Blu-ray Drive Combo is loaded with features such as Blu-ray 3D support, 2D to 3D DVD conversion, and DVD upscaling to HD 1080p. In addition to giving you your daily dose of high quality entertainment, this Blu-Ray drive features E-Green which saves over 50% power consumption. The Dolby EX and DTS-HD complements the stunning visuals with high-impact audio output, providing the kind of entertainment you deserve. 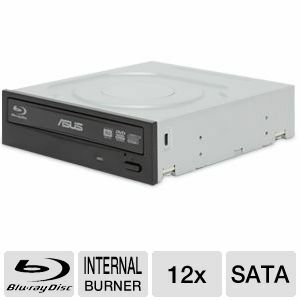 Purchase the ASUS BC-12B1ST 12X Internal Blu-ray Drive Combo. This product works great! I've been using it for a while and yes, it does in fact play BLU RAY DISKS! You can tell this product is stellar, because it is made by Asus, and like this product, they rock!